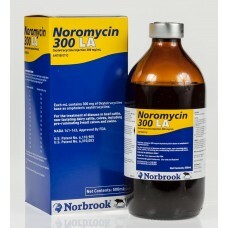 Noromycin 300 LA has a 28 day slaughter withdrawal time in cattle and swine. Do not use in lactating dairy animals. Administer subcutaneously or intramuscularly to cattle; administer intramuscularly to swine. When Noromycin 300 LA is administered according to label instructions, most animals show a noticeable improvement within 24-48 hours. Ready to use, sterile solution requires no mixing.